Not only are wool socks comfortable and warm during the winter months, their insulating properties and moisture-wicking abilities make them ideal for wearing any time of year. Finding the best wool socks for your feet means reading reviews, studying product features, and diving into the ins and outs of available blends and color options. With the right pair of wool socks, your tender tootsies can feel comfy and cozy no matter what you get up to during the day. We reviewed dozens of wool socks to identify the best of the best, based on Amazon reviews, how well they fit, cost, and other considerations. We narrowed our search down to 5 of the top-rated wool socks people can purchase to ensure happy and healthy feet. your feet feeling warm and cozy, and in tip top shape. These benefits allow you to go about your day in comfort and style, no matter the weather outside. The DG Hill 3 Pairs Thermal 80% Merino Wool Socks took the top spot on our list of the best wool socks, thanks in large part to their unisex design, neutral color scheme, and wide availability of sizes. They’re also made with 80% merino wool, to provide all the insulating and moisture-wicking properties people love wool socks for, but without an outrageous price tag. Those who purchased and reviewed these wool socks appreciated that they were comfortable and fit well. Some people were disappointed the labelling wasn’t 100% clear on the blend of wool used, which varies slightly by size, so read the description carefully when ordering. Most people found them to be quite warm, even on cold excursions. 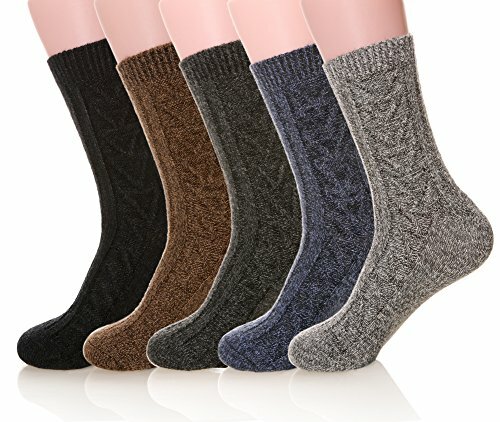 With a price tag of around $15/3 pairs, these wool socks are quite affordable, and the quality blend along with the unisex design more than justifies that price. They have a rating of 4.2 on Amazon with nearly 1,000 people reviewing them, which we think goes a long way in convincing people to make the investment. 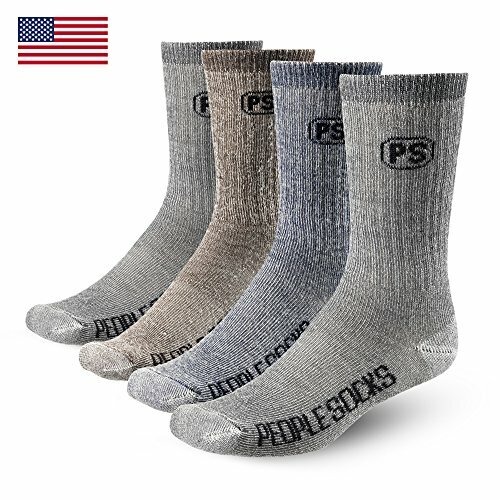 The People Socks 4 Pairs 71% Premium Large Crew Wool Socks took the second-place spot on our list of the best wool socks, and boast a blend of 71% merino wool, 21% nylon, 7% polyester, and 1% spandex for all-day comfort. They are machine-washable for added convenience, but are best air-dried in order to prevent shrinkage and increase their longevity. Those who purchased and reviewed these wool socks appreciated the quality that this set provided, even considering that it has a higher price point than our top pick. Even with daily wear, if cared for according to the manufacturer’s instructions, people found they lasted a year or longer. Several reviewers claimed to have switched to these socks exclusively as they found them so comfortable. At a cost of about $35/4 pairs, they are more expensive than our top choice for the best wool socks, but still aren’t outrageous. Given the quality craftsmanship associated with the brand, as well as the ease of care, the price is more than justified. They have a rating of 4.5 on Amazon with more than 4,500 people reviewing them, which we think goes a long way in convincing people to make the investment. The MIUBEAR Men’s 5 Pair Pack Wool Socks are our pick for the best budget-friendly wool socks, coming in at just a couple of bucks per pair. They are available in a choice of colors and knit patterns to suit any style, and feature a blend of 35% wool, 24% cotton, 36% polyester, and 5% spandex. They are designed to be lightweight yet breathable, and offer a fitted feel to help them stay secure throughout the day. Those who purchased and reviewed these wool socks appreciated that these socks kept their feet warm and comfortable throughout the day. Some people found them to be shorter than they would have liked, but at this price you can’t really complain. People liked how soft and thick these socks were, though some did wish they were a heavier weight. With a price tag of around $10/5 pack, these wool socks are a solid choice for those looking for a wool sock option on a budget. They have a rating of 4.2 on Amazon with nearly 100 people reviewing them, which we think goes a long way in convincing people that this budget-friendly pick is just as good at keeping tootsies comfy as more expensive options. 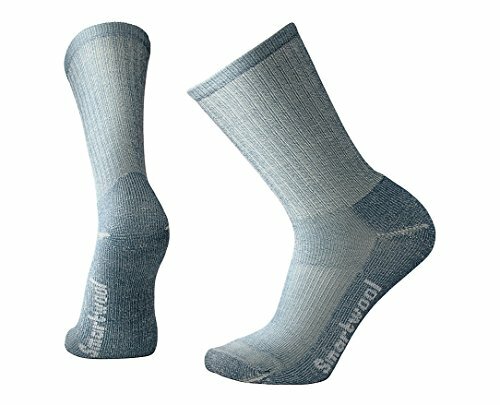 The SmartWool Hiking Light Crew socks are the best merino wool socks, and are suitable for wear year round. They feature a blend of wool, nylon, and elastic to be comfortable even during long periods of wear. Available in a choice of colors to suit any style, they have been made in the USA from imported yarn. Those who purchased and reviewed these wool socks appreciated that they were very comfortable, and that they stood up to years of wear. While they do come with a pretty hefty price tag, many reviewers felt that this quality and durability was well worth the added cost. Several people who experience very sweaty feet found these socks kept their feet comfortable without feeling wet or cold. At a cost of about $18/pair, they don’t come cheap, but the quality craftsmanship associated with the brand, as well as the comfortable fit and high merino wool content more than justifies that price. They have a rating of 4.7 on Amazon with more than 300 people reviewing them, which we think goes a long way in convincing people that they’re worth the investment. The Eocom 6 Pairs Children’s Winter Wool Socks come in a choice of sizes to suit all children from the age of about one all the way up to 12. They are made from 45% wool, 40% polyester, and 15% spandex to provide all-day comfort. Suitable for all-season wear, they are ideal for wearing around the house or while out and about. They absorb sweat, yet are still breathable and dry quickly. 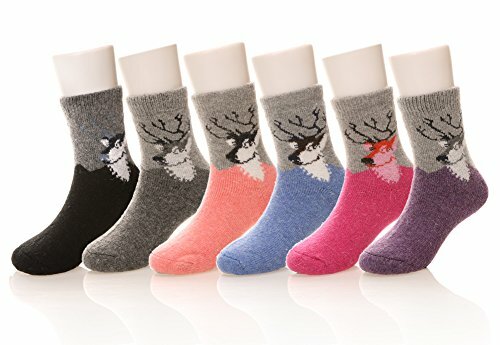 Those who purchased and reviewed these wool socks appreciated that they were super warm, commenting that they frequently used these socks during winter sports. Because they are thick, they can feel snug in some shoes. People liked that these socks didn’t shrink in the washing machine — and although one person complained they shrunk in the dryer, you shouldn’t really be putting products made from wool through the dryer anyways. With a price tag of around $15/6 pairs, these socks are very affordable, and the quality craftsmanship associated with the brand, as well as the ease of cleaning and quality warmth more than justifies that price. They have a rating of 4.3 on Amazon with more than 150 people reviewing them, which we think goes a long way in convincing parents to make the investment. Wool socks are an ideal choice for nearly anyone, and are especially cozy (and practical) during the colder months. Those who spend any amount of time outdoors during the winter will appreciate the insulating and moisture-wicking properties of wool socks. People who have sweaty feet will also benefit from wearing wool socks, as wool can absorb up to 30% of its weight in moisture while still retaining its insulating properties. It also dries fairly quickly, and the natural fibers are antimicrobial so they don’t get stinky like regular socks do. To keep your feet warm and toasty, be sure to check out our reviews of the best winter boots for men and the best winter boots for women. Size. The most important consideration when shopping for wool socks is the size. You want socks that Goldilocks would approve of — not too long, not too short, but just right. Type of wool. The next consideration when shopping for wool socks is what type of wool (or blend) the socks are made of. Merino wool is best for those with sweaty feet, and doesn’t itch. Padding. Socks that have padding on the heel and ball of the foot provide more cushioning and protection for the feet, making them comfortable for extended wear. Arch reinforcements. Some socks use a tighter, reinforced weave in the arch area in order to provide improved support, which can be helpful for those with high arches, although anyone can benefit. Height. In most cases, the height of a sock is merely a personal preference, but if you’re wearing wool socks with boots, crew and quarter socks can offer abrasion protection from boot tops. Price point. Finally, consider how much you are willing to spend on a pair of wool socks. 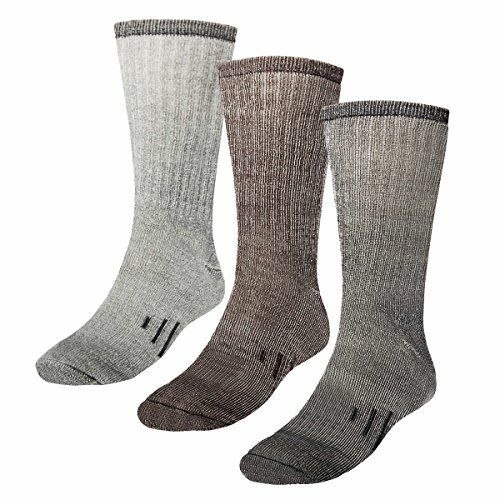 Wool socks vary in price from $2-$100 or more per pair. You can frequently find discounts and sales leading into the winter months, which can make buying wool socks more affordable. Wool socks are better than socks made from other material (such as cotton) for a number of reasons. First, wool is an excellent insulator, which means that your feet will stay warmer during colder weather and wool socks keep their insulating properties even when wet. Wool socks also absorb sweat and moisture better than cotton socks, helping keep feet feeling comfortable — especially key for those who deal with sweaty feet. Wool socks dry faster than socks made from other materials, and feature anti-bacterial properties which make them odor resistant. Which type of wool is the warmest? The warmest type of wool in the world is made from the downy fibers of the musk ox, and is known as qiviut. While it is 8 times warmer than regular sheep’s wool, it’s also very expensive — a pair of qiviut socks will set you back nearly $200. The warmest, most readily available wool is from alpacas. It is about 3 times as warm as traditional sheep’s wool, lightweight, and hypoallergenic. What socks are good for sweaty feet? The best socks for sweaty feet are those made from merino wool. With its light, soft, and moisture-wicking properties, it won’t make feet feel hot nor trap moisture. Amazingly, merino wool can absorb up to 30% of its own weight in moisture and will still not feel wet. Plus, it dries quickly and breathes well, and is naturally antimicrobial. Merino wool is a type of wool that comes from merino sheep, and is well-known and regarded for its softness, shine, and breathability. A merino wool fiber can absorb and retain up to 30% of its own weight in moisture, and still feel dry to the touch. Because the fibers are finer than traditional sheep wool, it doesn’t itch. It also boasts thermostatic properties, which means that it keeps your feet warm or cool, so you feel comfortable no matter the weather. We looked at 20 other wool socks. Even though they didn’t make our 5 best wool socks list, they’re the best of the rest and each is still a great option for your feet. The information you’ll need to compare each one is included with the listing. These wool socks come in a convenient 4-pack, and feature a blend of 71% merino wool, 21% nylon, 7% polyester, and 1% spandex. Reinforced stitching at heel and toe offer a more durable fit. These socks boast a blend of 35% wool, 24% cotton, 36% polyester, and 5% spandex, and are soft and breathable for all-day wear. These socks boast a blend of 67% acrylic, 16% wool, 10% polyester, 6% nylon, and 1% spandex. The comfort top design ensures they stay in place all day long, and they are machine washable for added convenience. These socks boast a high density knit, along with a true seamless toe and ribbed support that make them comfortable for all day use. Underfoot cushioning adds to the comfort. These wool socks feature a blend of 50% merino wool, 40% nylon, 9% polyester, and 1% spandex. They offer a lightweight, breathable feel, with a snug fit that stays in place all day long. These socks boast a blend of 42% wool, 24% stretch nylon, 21% polypropylene, 7% stretch polyester, 5% olefin, and 1% spandex. They are made in the USA and feature a stay-put knee, heel, toe, and shin. These socks boast a blend of 66% merino wool, 33% nylon, and 1% elastane to provide comfortable all-day wear, and feature a cushioning design along with an elasticized arch brace. These wool socks boast a blend of 67% merino wool, 29% nylon, and 4% lycra spandex to offer a comfortable performance fit. They are made in the USA, and feature high density knitting. These socks boast a blend of 33% merino wool, 33% acrylic, 33% polyamide, and 1% elastane for strength and durability, and are ideal for wearing in all seasons. These socks boast a blend of 70% merino wool, 29% nylon, and 1% elastane to provide a comfortable and luxurious feel that’s suitable for wearing year round during a variety of activities. The women’s specific design ensures a better fit. These socks boast a blend of 35% wool, 24% cotton, 36% polyester, and 5% and spandex, and offer a comfortable, lightweight, and versatile design with stylish patterns. These socks boast a 30% wool, 40% polyester, 20% acrylic, and 10% spandex construction. They are a knee-high length and medium weight, making them ideal for wearing under winter boots. These socks boast a blend of 35% wool, 24% cotton, 36% polyester, and 5% spandex, and come in a 5-pack for added convenience. These socks boast a blend of nylon, merino wool, lycra, and spandex, and are suitable for wearing year round. The fine gauge knitting offers outstanding comfort and durability, while the seamless toe is a nice finishing touch. These socks boast a blend of 77% merino wool, 21% nylon, 2% elastane. The super low cut design makes them ideal for wearing inside flat shoes, and keeps them hidden from view. These socks boast a blend of 45% wool, 30% polyester, and 15% spandex, and come in a convenient 5-pack. They are super soft and comfortable, making them ideal for year round wear. These socks boast a blend of 50.4% polyester, 17% wool, 15% chinlon, 15% acrylic, and 2.6% spandex. They feature a thick design that makes them ideal for wearing in cold weather. These socks boast a blend of 61% merino wool, 37% nylon, and 2% elastane. Their unique design means they won’t feel snug in your little one’s shoes, and are machine washable for added convenience. These socks boast a blend of merino wool and lycra that will help keep your kiddo’s feet feeling warm and cosy, without any annoying slipping or bunching up. These socks boast a blend of 50.4% polyester, 17% wool, 15% chinlon, 15% acrylic, and 2.6% spandex, and are super thick to keep your child’s feet warm and cosy no matter the weather.